On November 4, 1946 Django Reinhardt made his American debut at the Music Hall in Cleveland. Reinhardt, a Belgian jazz guitarist, had been invited to open for Duke Ellington on a small tour of the Midwest United States. 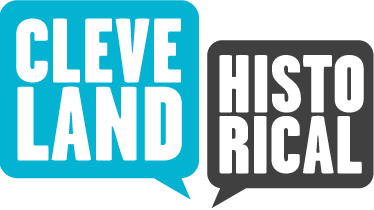 Reinhardt, a headliner in Europe, arrived in Cleveland without a guitar. He assumed that music companies would compete for the honor of having him play their instruments. Reinhardt quickly learned otherwise and was forced to buy a guitar. Local promoters further complicated Reinhardt's US debut and failed to capitalize on the moment, purchasing only a small ad in the local papers - an ad that failed to mention Reinhardt's involvement, simply stating, "Elroy Willis presents Duke Ellington and his Orchestra at the Music Hall." 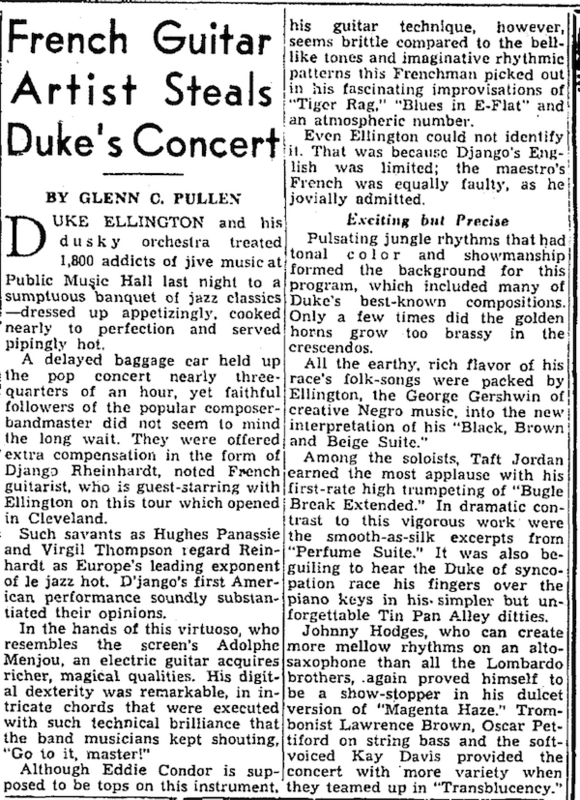 Despite the oversight, the Cleveland Plain Dealer reported that 1,800 people attended the concert. After a 45 minute delay - as the musicians awaited the arrival of a baggage car carrying Ellington Orchestra's instruments - the crowd finally heard Django Reinhardt's first US performance. The act was such a hit that Reinhardt and Ellington would go on to play in other major cities in the Midwest before concluding their tour in New York City at Carnegie Hall. Picking at a Guitar: Django Reinhardt, legendary jazz guitar player, made his United States debut in Cleveland on November 4, 1946. His show was almost derailed because he failed to bring a guitar with him. He wrongly thought that American companies would clamor for the honor of letting him use their guitar. Instead, he had to go out and buy his own. Image Courtesy of Library of Congress, Gottlieb Collection. 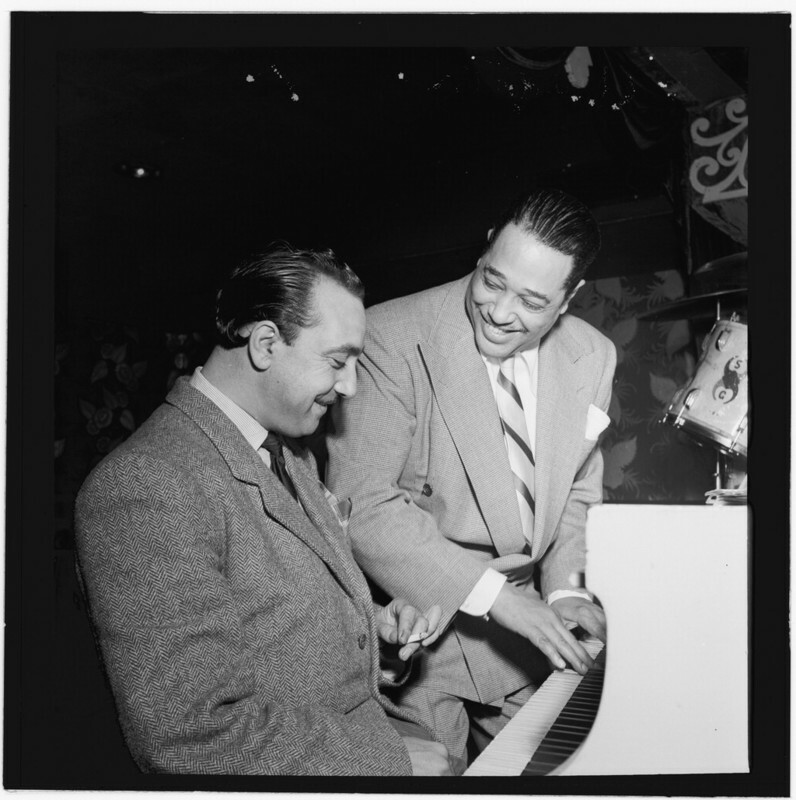 Django Reinhardt and Duke Ellington, 1946: Ellington greatly admired Reinhardt, having been quoted saying Reinhardt was "the most creative jazz musician to originate anywhere outside the United States." When Reinhardt joined Ellington for the tour, the Duke payed for the guitarist's trip. Although the tour was extremely important in jazz history, it was not without its problems. The language barrier between the two legendary musicians was a problem, with Ellington speaking very little French and Reinhardt speaking extremely limited English. Image Courtesy of Library of Congress, Gottlieb Collection. Django Reinhardt performs J'attendrai, 1939. This recording is in the public domain and can be found, along with other recordings by Django Reinhardt, at archive.org. 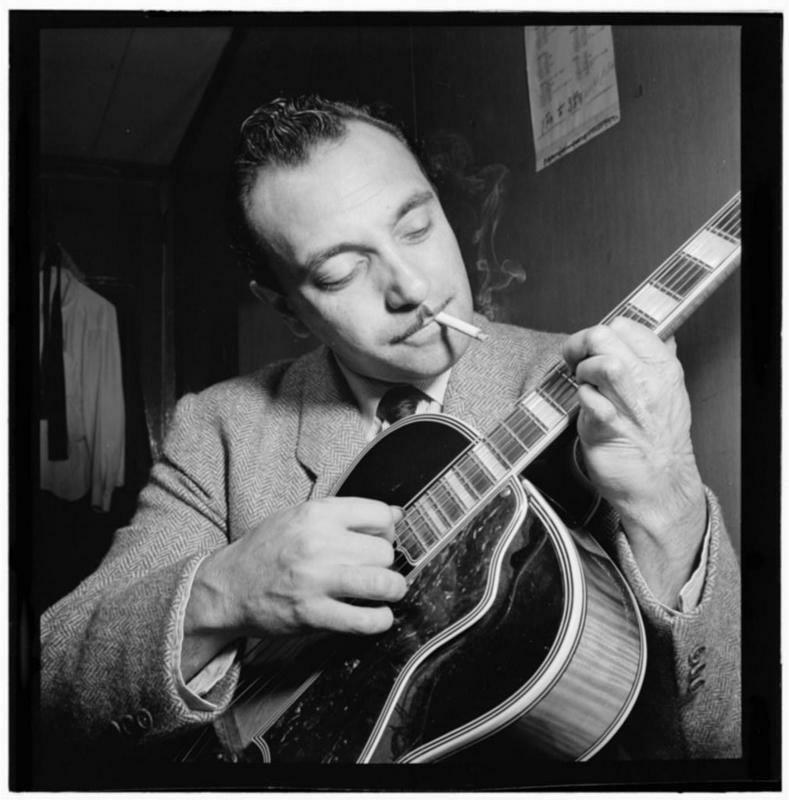 Robin Meiksins, “Django Reinhardt at the Music Hall,” Cleveland Historical, accessed April 19, 2019, https://clevelandhistorical.org/items/show/525. Published on Jul 24, 2012. Last updated on Apr 18, 2017.